The US aircraft carrier Harry S. Truman, which set sail from the world’s largest naval base in Norfolk (Virginia), entered the Mediterranean with its strike group. 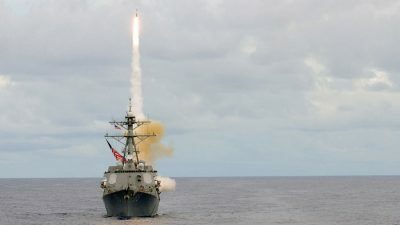 The strike group consists of the guided-missile cruiser USS Normandy and the guided-missile destroyers USS Farragut, USS Forrest Sherman, USS Bulkeley, and USS Arleigh Burke. Two others, USS Jason Dunham and USS The Sullivans, will rejoin the strike group at a later date. German destroyer FGS Hessen is added to the Truman strike group. The fleet, with more than 8,000 men on board, has an enormous firepower. The Truman – a supercarrier 300 meters long, equipped with two nuclear reactors – can launch 90 fighters and helicopters in consecutive waves. Its strike group, supplemented by 4 destroyers already in the Mediterranean and some submarines, can launch over 1,000 cruise missiles. The US Naval Forces Europe-Africa – whose headquarters are located in Naples-Capodichino while the base of the Sixth Fleet is located in Gaeta – are thus strengthened. They are under the orders of the same admiral (currently James Foggo) who commands the Allied Joint Force Command Naples at Lago Patria. The deployment of the US fleet in the Mediterranean is part of the overall strengthening of US forces in Europe, under the orders of the same general (currently Curtis Scaparrotti) who holds the position of Supreme Allied Commander in Europe. In a congressional hearing, Scaparrotti explains the reason for the strengthening of US forces in Europe. What he presents is a real war scenario: he accuses Russia of carrying out “a campaign of destabilization to change the international order, fracture NATO and undermine US leadership around the world”. After “the illegal annexation of Crimea by Russia and its destabilization of Eastern Ukraine”, the United States, which deploys over 60,000 troops in European Nato countries, has increased its posture in Europe by deploying an armored brigade combat team and a combat aviation brigade, and by pre-positioning equipment for additional armored brigade combat teams. At the same time the US doubled its maritime deployments to the Black Sea. To strengthen its forces in Europe, the United States spent more than 16 billion dollars in five years. At the same time the US pushed the European allies to increase their military spending by 46 billion dollars in three years to strengthen the NATO deployment against Russia. This is part of the strategy launched by Washington in 2014 with the putsch of Maidan and the consequent attack on the Russians of Ukraine: making Europe the first line of a new cold war to strengthen the US influence on its allies and hinder Eurasian cooperation. The NATO foreign ministers reaffirmed their consent on April 27, preparing a further expansion of NATO to the East against Russia through the entry of Bosnia-Herzegovina, Macedonia, Georgia and Ukraine. This strategy requires an adequate preparation of public opinion. To this end, Scaparrotti accuses Russia of “using political provocation, spreading disinformation and undermining democratic institutions” even in Italy. He then announces that “the US and NATO counter Russian misinformation with truthful and transparent information”. In their wake, the European Commission announces a series of measures against fake news, accusing Russia of using “disinformation in its war strategy”. It is to be expected that NATO and the EU will censor what is published here, by decreeing that the US fleet in the Mediterranean is a fake news spread by Russia in its “war strategy”. This article was originally published in Italian in Il Manifesto. Manlio Dinucci is a Research Associate of the Centre for Research on Globalization.